Friday April 9th 1897 I was busy all the morning with the work and getting the dinner. Hatt and I went over to Auntys for a call and then Rob took us up to Nelsons before supper. Spent the evening visiting at home. 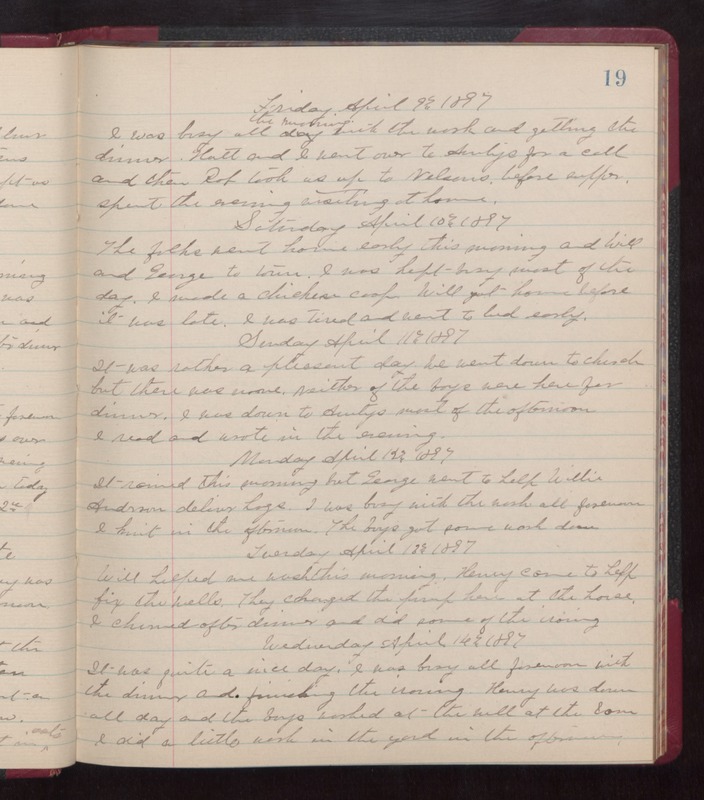 Saturday April 10th 1897 The folks went home early this morning and Will and George to town. I was kept busy most of the day. I made a chicken coop. Will got home before it was late. I was tired and went to bed early. Sunday April 11th 1897 It was rather a pleasant day. We went down to church but there was none. Neither of the boys were here for dinner. I was down to Auntys most of the afternoon. I read and wrote in the evening. Monday April 12th 1897 It rained this morning but George went to help Willie Anderson deliver hogs. I was busy with the wash all forenoon. I knit in the afternoon. The boys got some work done. Tuesday April 13th 1897 Will helped me wash this morning. Henry came to help fix the wells. They changed the pump here at the house. I churned after dinner and did some of the ironing. Wednesday April 14th 1897 It was quite a nice day. I was busy all forenoon with the dinner and finishing the ironing. Henry was down all day and the boys worked at the well at the barn. I did a little work in the yard in the afternoon.